Whole30 Day 6 – Frigid. All I have to say today is that I’m glad it only got down to the negative teens with the wind chill, as opposed to, say, –50. It’s the little things you gotta be thankful for, right? As frigid and bitterly cold as it was, it made me extremely thankful for the things I have – a husband who started my car for me this morning so it would be warm when I left for work. A toasty warm house with a roof over my head. Fuzzy socks and sweatpants. A pot of chili cooking on the stove. I can’t really complain too much about how cold the weather is when I have an insulated coat with a hood, several pairs of gloves to choose from, a hat, a scarf…and of course, my Uggs! There was a time, not so very long ago, that I thought Uggs were the ugliest thing on Earth and I swore I’d never own a pair. And then Kevin got me a pair for my birthday last year and I stuck my feet inside and it’s a miracle I ever take them off! Breakfast, 0730: I was fortunate enough to be able to sit down and have breakfast with Kevin this morning, which always makes my day a little brighter. This morning we had roasted sweet potatoes topped with eggs scrambled with onion, bell pepper, spinach, and cherry tomato. Colorful and delicious! Lunch, 1130: I didn’t make it until noon again today, but I’m starting to think that that may not be a bad thing. I was starting to feel hungry but not famished, so I sat down with my packed lunch. 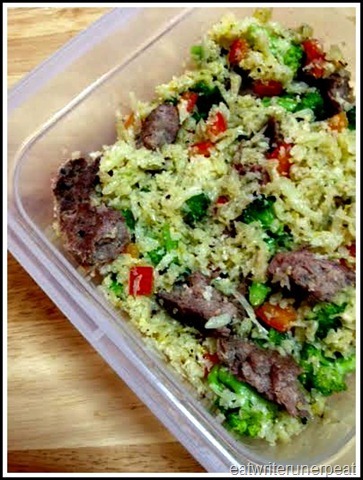 The picture above doesn’t look like much – I made another batch of cauliflower rice, this time with sauteed broccoli, red pepper, and saffron, and I crumbled up a grilled hamburger patty and combined it for a sort of hodgepodge meal. I was surprised at how good it tasted! Kevin grilled the hamburgers on a charcoal grill with hickory smoke wood chips, and the smoky flavor really blended well with the cauliflower rice. I had a bag of raw veggies on the side to snack on but as it turns out, I didn’t need them! Dinner, 1830: With the weather outside being frightful, all I could think about was a big bowl of steaming chili. True, the bowl of chili in my dreams was topped with shredded cheddar cheese and sour cream and served with a big ole’ piece of cornbread on the side, but the reality turned out to taste just as good! (If not better!) I loosely followed this recipe from Robb Wolf and it came out thick and hearty and exactly what I was craving on this cold January day! I really liked the hint of sweet from the pumpkin pie spice (who knew?!) and the coffee gave it a little extra kick of something. 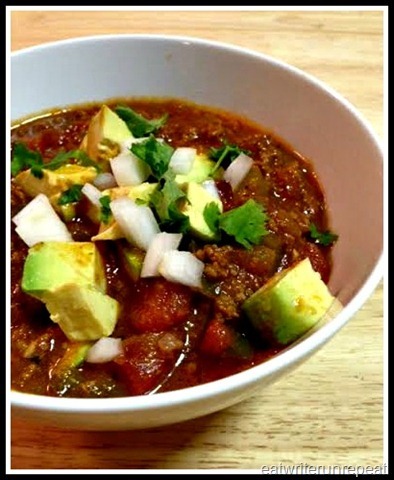 I enjoyed my chili topped with some creamy avocado slices and some diced onion and cilantro. Yum. Posted on 8 January 2014 7 October 2015 by BeePosted in Paleo, Whole 30Tagged clean eating, clean food, paleo, whole food, Whole30. I am always annoyed when things I swear I will never own turn out to be fantastic. It was the same way with me and a Lululemon winter top, work out clothes should not cost that much. Pingback: I finished the Whole30! One week later… | eat. write. run. repeat!